Please feel welcome to add your message of encouragement, comment or review to our guest book. Many people have verbally expressed praise for Gail's new and timely book, The Question Space. Have you read it and found it helpful in your situation? Would you like to write a review? Share your thoughts and comments with all who appreciate what Gail has written in her book. "We have just finished reading your wonderful book The Question Space. We found every part of it very helpful." "This is a book of good practical common sense. It is a worthwhile read on a sometimes difficult topic and an easy to read book which covers the paths to recovery from many forms of bullying." 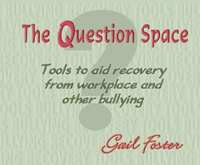 "A commendable book written by Gail Foster: 'The Question Space: Tools to aid recovery from workplace and other bullying.' The information shared in Gail's book has been thoroughly researched and contains a wealth of experienced wisdom. This book will support recovery from the trauma of being bullied and gives tools to 'help yourself' during the recovery process. Resources referred to by Gail are also of great benefit to further your knowledge regarding bullying and the devastating outcomes of bullying. Congratulations Gail! for having the courage to 'speak out' about your experience and for helping others in their personal trauma of being bullied. You indeed epitomize the quote in your book by Winston Churchill - 'Courage is rightly esteemed the first of human qualities...because it is the quality that guarantees all others.'" "Gail Foster’s ‘The Question Space' is a valuable resource with (to me) sound insights into the symptoms and consequences of bullying and sound advice on topics ranging from; · how to look after yourself during and following a stressful experience (by listening to your body, self-help, self-nurturing, strategies for turning around a downward spiral in your thinking); · to how to inform yourself about bullying, depression, PTSD and grief; ­ to understand the special capabilities and vulnerabilities of highly sensitive people; ­ to deal and cope with a bully; ­ to let go, move on and ­ to build resilience, find and work with external support and help resources. There is also discussion of factors that trigger bullying including organisational culture and psychological dimensions." "Dear Gail Hearty congratulations on your book. From my perspective – having worked in the bullying space for over 10 years trying to support people at the ATO who are or have been bullied – it is a sound, comprehensive, valuable piece of work. I have, like you, also been driven to reflect on the experiences of bullying shared with me and pass on some perspectives and insights from my professional background. If I may, I’d like to share with you my thinking on (i) how to reduce the chance of bullying by creating a safe workgroup environment (culture) where it is safe for people to speak up as soon as they feel uncomfortable; (ii) how important it is for people to speak up and talk about their discomfort early on and (iii) how people can speak up in maximum safety, so that they minimise the chance of the other person retaliating. Re (i) - Is about shaping and sustaining organisational culture where bullying is prevented from being experienced, which is touched on in your book, but which, understandably, is not elaborated on – I say, understandably, because it is yet another area of professional focus and you have already covered more than enough of these (focuses) in your ‘travels’ – and also there is not a lot most employees can do on this front. I would have liked to see a reference to this organisational development sense of ‘prevention’, as well as the ‘listen to what your body is telling you’ sense used at Loc.276. They are both very important in preventing potential bullying situations from developing into a fully fledged bullying experience. Though I offer ideas on what an individual who is not a team leader or higher, can do, it is admittedly a big ask. I guess my constructive point here is that not only do people need to take on board all the wise perspectives, tips and actions you suggest, but also managers, employers, workplace rules and regulations, workplace cultures need to take steps to create safer workplaces where bullying does not arise. . . ."
"Gail darling I really liked your book!! It was user friendly and meaningful as well as practical!! Sincerely Fay Fay Jackson CEO Vision In Mind & NSW Mental Health Deputy Commissioner." "“This easy to read and very practical book combines the knowledge of a professional with the understanding of one who has been the target of a bully. Think spots encourage deep thinking and grow spots illustrate step by step ways to use this awareness for growth and recovery. I loved the ABC strategy. It is a simple and very useful tool to establish boundaries with a bully.”"
"'Lovingly written, a concise and comprehensive emotional and practical guide for people bullied at work.' 'Adrian Melia, curator of the Tim Field Foundation'"
"Thank you so much for contacting me to tell me about your new book, 'The Question Space'. I have duly purchased an e-book and I can immediately tell by dipping into it, and by the reviews, that this is one special book! The world of bullied adults is just that little bit luckier thanks to you. I shall put a link to your website on bullyonline.org in due course." "Hi Gail, I am so loving and enjoying reading through your most resourceful book. A fantastic resource of tools, insights and experienced that will bring hope and aid in the recovery journey of many, I hope thousands, who have been at the receiving end of workplace bullying. I am proud to promote your book on Ron Cruickshank Relationship Transformation Centre GREAT WORK!!" Submit your comments using the form below. All comments are read and approved by Gail before they are posted to this guest book page. PLEASE NOTE: We ADD the quotation marks at the beginning and end of your message.